It’s Father’s Day, so let this be the year we all finally recognize that dads and their goofy dad stuff—monster faces, silliness, mockery; perhaps even dad jokes, if the judges are feeling lenient—could be as essential to childrearing as any of that mom stuff. Or, at least, that a Platonic ideal of “mom” is not the ultimate standard for parenting. Who’s with me?! Moms and dads are different! But equal! Standard research that looks at how parents bond with their children has typically focused on moms and used mom-styled parenting as the line to which everything else must measure up. After all, moms kind of do all the work—and have for most of history, whether they felt up to the task or not. But in spite of all the good aspects dads bring to the rearing of their children, they haven’t historically scored well on bonding tests. That’s all changed, thanks to new research. In a piece over at the WSJ, Sue Shellenbarger looks at studies from the last two years that focus on the ways in which uniquely “dad” approaches to parenting are a valid and useful part of bonding between parent and child and also child development. Shellenbarger talks to Dr. Kathryn Kerns, a psychological sciences professor at Kent State who discovered that, when she surveyed 30 teens and preteens about their relationships with their dads, many kids described their dads in warm terms but gave answers that put their dads in a low score range on Kerns’s standard bonding test. She found that, when she tweaked the test to add questions about whether dads were encouraging and/or enriching, the scores went up. Dr. Kerns is one of a growing number of researchers creating new tests and techniques to document the father factor. 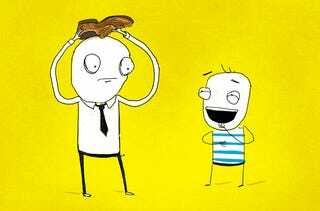 More than a dozen studies in the past two years are yielding new insights into the nuances, and the value, of the seemingly random, sometimes silly play many dads engage in with their children. The research could offer dads more leeway in their play with children, suggesting there’s no need for moms or others to worry when fathers stir up or challenge their children—as long as the kids are happy and having fun. Also, dads sometimes can stop a child’s fussing or crying through joking or physical play. It’s hard for me to imagine that no mothers have ever used these silly tactics, or that if they did, joking or physical play would actually be ranked somehow lower than calming a child with soothing or comforting—whatever works, right? This stuff also has something to do with temperament and disposition. But the important thing to note here is that exploration and risk-taking—things typically more associated with dad parenting—have been getting short shrift in these studies. They shouldn’t, nor should other methods dads might use more often to get a kid to calm down so long as they are effective and not harmful, like using intrusiveness or interruption. The equalization of parenting techniques will be good for everyone: Research shows that when moms interrupt a child’s play or pick a game for them, it’s regarded as a bad thing, but when dads do, it isn’t. The new research is sparking some freewheeling antics. In one study, when a preschooler grew tired and started crying, his father flipped the child upside-down into a midair headstand. Another dad sparked his toddler’s interest in playing by yelling in mock distress, “Ow, that smarts!” when the child used a toy doctor’s kit to give him an imaginary shot in the arm. New parents also exhibit differences in bonding behavior. In a study of 100 mothers and fathers interacting individually with their five-month-old infants, mothers tended to gaze into their babies’ eyes, mimic their babbling and touch them affectionately, according to a 2013 study in Attachment & Human Development. Fathers were more likely to arouse the babies, using quick motions to get them to laugh or encourage them to explore. To me, this is the more important takeaway—obviously, research that looks at how parents bond should look at parents, regardless of gender. Different approaches are valid and should be treated as such. But hell yeah! We can all adapt! This stuff has its roots in deep gender socialization, but it’s not written in stone. The yardsticks researchers typically use to assess parent-child bonding have been tested mostly with mothers, and work best in capturing the soothing, comforting behaviors more common to moms. That is partly because it is difficult to get fathers to take part in lab studies, says Natasha Cabrera, a professor of human development at the University of Maryland in College Park and a leading researcher in the field. Fathers tend to work long hours, to be less likely to live with their children, and to be more private about their parenting. Dr. Cabrera once spent three years finding 50 fathers willing to take part in a study. It’s a smidge funny, the lengths to which researchers have gone to give dads a leg up on feeling valid to the parenting process. If only we could go to such lengths to include women in studies where they get short shrift because the baseline is a male standard, like military service, sports performance, medical research and psychology, in the interest of fairness and inclusivity. At any rate, if you’re showing any trad-dads in your circle appreciation for their dadding this weekend, be sure to let them know all those silly faces really paid off, in case they were feeling less than appreciated. Though they probably weren’t. Moms still seem to have the monopoly on that.